The longest day in the race, this could be a day for a breakaway. As well as the usual preview fare there’s also a quick note below on the GP E3 Harelbeke which is planned to finish 20 minutes after today’s stage. Stage 4 Wrap: an early breakaway contained Thomas de Gendt who kept alive hopes of a repeat of his Stelvio stage win in the 2012 Giro at least until he was caught with 7km to go. Before the race started we expected a battle between Chris Froome and Alberto Contador but the Queen Stage skipped a generation with a win for Tejay van Garderen, aged 25, his first in the UCI World Tour. When the others jumped on Stage 4 he quietly winched his way across to them; this time he was the one with the explosive finish and took the stage just ahead of Ag2r’s Romain Bardet, age 23. Froome and Contador did try some moves but they were reeled in with Joaquim Rodriguez policing his rivals. The cold was a big factor, -3°C at the finish and despite the uphill effort the riders were frozen with Bardet unable to change gears thanks to frozen hands. 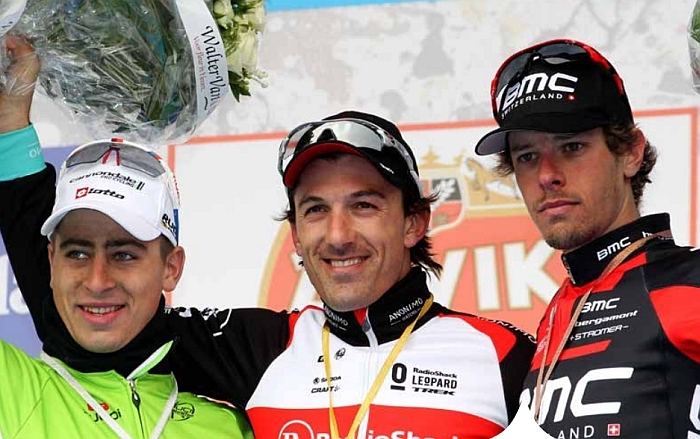 When Joaquim Rodriguez walked onto the podium he did so with a theatrical shiver and rubbing his hands to show the cold. It all means the GC is as foggy as yesterday’s finish and with the top seven riders separated by just 18 seconds. The return of time bonuses means we could see some scrapping especially as Sunday’s final stage on the Montjuic circuit is just the kind of place where a rider can pull out a few seconds. The longest stage of the race, the race sweeps south-west across Catalonia. That final spike after 210km is on a Nacional road, meaing it’s wide and the kind trucks can use. But it’s still 6km at 4.8% with a hairpin bend just before Lilla. The descent is equally large. The Finish: a flat finish in town on a wide road but preceded by a couple of tight turns in the final 1,500m. The Scenario: a breakaway or a sprint? If this was any other stage race the odds would lean to a bunch sprint because several teams would chase all day to set up their riders. Only here there aren’t enough sprinters and accompanying teams. The Contenders: if it’s a sprint Luka Mezgec (Giant-Shimano) has been well above the others. Orica’s Leigh Howard is his biggest rival but lost leadout wingman Brett Lancaster yesterday. As for a breakaway it’s a random pick, maybe Thomas Voeckler again but there are few riders who might feel obliged to try after coming a little short in the mountains. Think Lieuwe Westra, Pierre Rolland, Przemyslaw Niemiec or Jurgen Van Den Broeck. This isn’t meant as a criticism, more that the race hasn’t worked out but they have the talent to try an alternative. Weather: after the snow and fog the 15ºC might feel warm especially if the sun pokes through the cloud. There will be a 20km/h crosswind for most of the day, normally the minimum windspeed to split the bunch but this isn’t Belgium and the experts of the echelon are doing the GP E3 Harelbeke. E3 Harelbeke: time limits mean a preview of this race isn’t possible but it’s on today and on TV too with Eurosport and other means using the links above. The finish is expected around 5.20pm which is ideal to catch the end but beware in case the race runs ahead of schedule. Daily Diaz on the economy: 18 % of Spanish wealth is produced in Catalonia. Traditionally the most industrialised of the country, Catalan economy relies nowadays on the services, and is a very popular tourist destination (especially Barcelona). In Catalan nationalism there is an economic factor, as many people feel Catalonia gives Spain more money than other regions and gets less in return, which might explain the unemployment rate. What a bore yesterday, fog or no fog. Contador complained of the course. It can certainly be improved. Last year it was better. 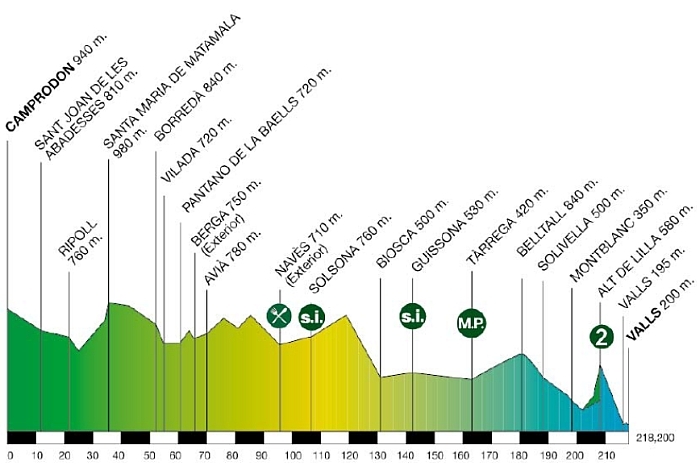 But we still need some ITT there… And when will the race use the Coll de Fumanya/Pradell?? And when will it return to the Mont Caro? And you’re right, what’s all this use of “Nacionales”? Good races require narrow, twisted country roads! Anyway, let’s hope these last 2 days in the cold take some toll, and we can see some surprises and ambushes in the last stages. Nice post. Gonna be good today. 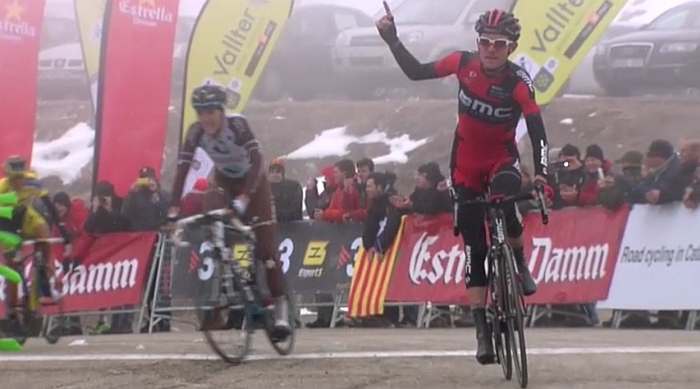 all makes me quite optimistic for some great GC racing in the summer actually. Is it just me or have the rest of the peleton finally woken up and caught up with Sky in preparation, appliance of (legit) science, marginal whatnots etc etc. maybe the Death Star pull it all together, but I actually hope they don’t…. I totally understand the technical difficulties that lead to a lack of pictures yesterday, but I’m at a loss as to why something couldn’t be salvaged, at least for the final climb. Give a couple of the motorbike cameramen on the front of the race cameras that record the action internally and then edit together 30 minutes for the fans to watch as highlights afterwards. OK, not perfect and does require a little forward planning, but this is the queen stage with big names battling it out. Instead all we get is a white screen and Kirby’s usual blathering. Why does everyone hate the commentators? turn the sound down and watch the race! well said I don’t watch it for the commentators. I watch for the race. Previous post: Where Are You?